The past two nights I have spent my time baking and cooking. I made the usual Halloween cupcakes, but I also wanted to try to make those sugar cookies that look like candy corn candies to hand out in goodie bags in Audrey's class today. Unfortunately, there is no picture of those as I completely burnt them last night. But! I did attempt to make jello-filled oranges for the girls breakfast this morning that look like these sorbet filled ones from Martha Stewart. 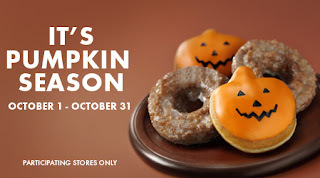 I also stopped by the Krispy Kreme yesterday by my office and picked up the Pumpkin shaped doughnuts. So I left the sugar-high kids with Ray this morning to get to work early so I could leave early for Audrey's party this afternoon. The girls had Halloween purses on their breakfast chairs this morning - both with light up rings and Ashley with crazy socks for her to wear to school today (it is spirit day, she is not allowed to dress up) and tattoos for Audrey. Maybe for Thanksgiving my baking skills will improve? Ashley will be Sharpay from High School Musical tonight (I know, SHOCKER) and Audrey will be a "pink princess" which is actually Ashley's old Halloween costume from a few years ago. Thankfully it is supposed to be a little warmer today, because the past few days? Cold. At least to me. Here's another shocker - ABby is going to be Hannah Montana. Emily is also going to be the "pink princess" aka - Sleeping Beauty. Have a good one! Holy crap. Can I come to your house for breakfast? Big shocker, my girls are going as princesses. Ariel in her wedding dress and Tinkerbell. Take lots of pictures so we can scrapbook them :) See you tomorrow! What a great mommy! Such wonderful surprises for the girls! Amy, will you be my mom? Or at least give me lessons... because come across the best ideas! Too cute. Caleb is going to be Thomas the Tank Engine. We're having his b-day party tomorrow and it's Thomas the Tank themed also :) Happy Halloween! 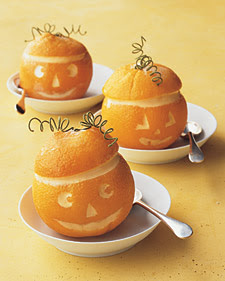 Such cute ideas to make Halloween fun and exciting for your kids! We carved pumpkins last night and decorated the tree in our front yard with ghosts and skeletons. And I made halloween cinnamon rolls for breakfast! I love Halloween! Have a fun evening of Trick-or-Treating! Just in time for Halloween, you've been BOO'ed. Wow! You are the best mom in the whole world in my book. I didn't bake anything AND I sent the frosting and sprinkles for the party in my daughters backpack then I made her take the bus. Impressive, huh? Yikes! What a great treat for your girls! You ROCK Mom!! !